Pandit Deendayal Petroleum University will be celebrating it’s 10th Annual Cultural Fest FLARE from 11th to 14th April 2019. With time, FLARE has grown as the much-anticipated festival in and outside the state. FLARE comprises of various events in the areas of Dance, Dramatics, Music, Fine Arts, Literature, and much more. The flagship events in FLARE like Amethyst, Ablaze, At-Mosh-Sphere, Melodia and N-zest have gained much attention among the youth because of opportunities provided to the winners which help them excel in their field and develop further. This time FLARE is back with new events and exuberant experiences. 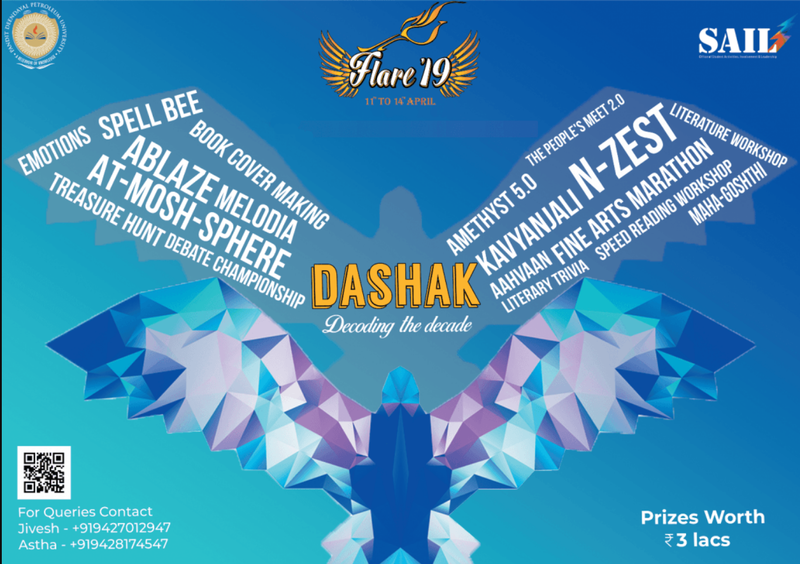 With the theme ” DASHAK – Decoding The Decade”, FLARE celebrates the 10 years of its glory. Amethyst is a way of saying who you are without having to speak. Amethyst 5.0, a flagship event of Flare, invites models across colleges to showcase their styles and make heads turn with their ramp walk. At-mosh-sphere – The battle of bands offers you a chance to live the experience to perform as a part of the band and singing in front of a live audience.